The night sky doesn’t get much more exciting than it will over the next two weeks. The Perseid Meteor Shower will peak this weekend, followed next week by a total solar eclipse, which will be visible across the United States as well as in Canada, Central America, Mexico, the Caribbean Islands and northwest Europe. Remnants of debris from the comet Swift-Tuttle, the Perseid meteor shower runs from mid to late July through the middle of August. This year, its peak level of activity is expected to occur on Saturday, August 12. Discovered individually by Lewis Swift and Horace Parnell Tuttle in July of 1862, this comet has a 133-year orbital period and was last observed in 1992.2 Meteor showers are named for the constellation they appear to emanate from. In this case, the vast majority of the meteors appear to come from the constellation Perseus. Despite Perseus being a northern hemisphere constellation, observers south of the equator will get to share in the spectacle, although the frequency and abundance of meteors may be mildly diminished in the southern hemisphere. During the peak, meteors can be observed all through the night; however, they are at greatest intensity in pre-dawn skies. Direct your attention to the north-northeast portion of the sky, in the area of Perseus just below Cassiopeia and in between Andromeda and Auriga. This is not to say you won’t see meteors in any other direction, but this will be the area of highest concentration. Additionally, August 12 is just the peak of the event, so we will be able to see significant activity in the days before and after the peak. Since we are just coming out of full moon phase, frequency may drop slightly due to some meteors getting drowned out by the light of our lunar neighbor. Fortunately, the moon will have set during those ideal pre-dawn hours. As with most astronomical observing, the darker skies you can find, the better. At home, you can increase the odds of seeing these falling stars by turning out all exterior lights and encouraging your neighbors to do the same. Use this as an opportunity to get to know folks where you live. 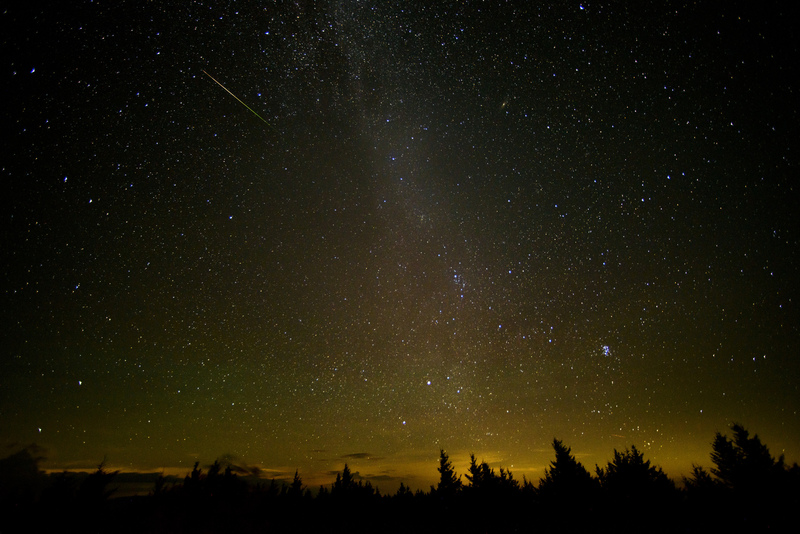 Make a night of the event and share the wonders of the naturally dark night sky. Another display of light will happen after the great Perseid shower, but this one takes place during the day—a total solar eclipse on Monday, August 21. It is the first time in almost one hundred years that a total solar eclipse has spanned the United States from coast to coast. While a path of totality occurs across just a handful of states in the entire continental US, other places in the country and around the world will experience levels of a partial eclipse. There are hundreds of websites dedicated to this event—simply search online for information on your location, including how and when to view. If you are fortunate enough to be somewhere in the line of totality, you will be in for a rare treat. However, keep in mind that observing our sun is a serious matter and must be done carefully and safely to avoid damage to your eyes. Please ensure that you are using only solar-safe observing equipment and that you never look at any part of the sun directly. Even momentarily exposing your eyes to direct sunlight can cause injury. If you are able, take time to witness this event (either solo or at the hundreds of festivals and functions worldwide). If you can’t witness it in person, there will be countless online resources to observe the event in real time. What an exciting month for observing the sky! Two stellar occasions coming to a dark sky near you. Prepare well and observe often.